Mondays with Mac: Are you joining us? I'm sorry for the lack of blog this week and general quietness if you interact with me on other forms of social media (and if not why aren't you?). As the Great Man Cold of 2013 left our house, I succumbed to a pretty horrific case of gastro-enteritis. This time I did, in fact, call my mom. Not really - she was just downstairs and she heard my cries of pain at 3 AM. Apparently Mama ears never quit. She asked if there was anything she could do and I pathetically squeaked out that she could keep me company. And then I instantly felt bad and told her that I'd be fine and she should go back to bed. I don't mind staying up with you. You're a mom now. You get it. And I did. I'm starting rejoin the human race now. 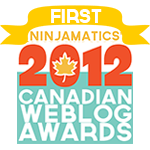 And that's convenient because tonight is the long awaited Once, We Were Stolen Twitter Club Party! 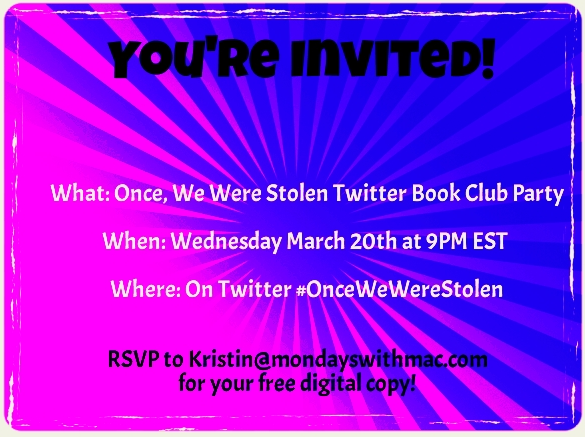 Join us at 9 PM EST on twitter with the hashtag #OnceWeWereStolen. Be sure to follow your hosts @monwithmac and @oncewewrestolen. You can read my interview with the author here. And if you still need a copy of the book you can purchase it here or here.